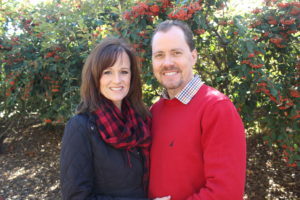 Scott and Terri were born again as children and grew up in solid Christian homes, immersed in an atmosphere of hunger for God. This propelled them toward a life of service in the Kingdom. They married in 1984 and graduated the following year from Christ For The Nations Institute in Dallas. For 25+ years they served in a number of churches throughout the Houston area, leading worship and ministering to children, youth, singles and young couples. In 2012 the Lord directed them to start Believers Fellowship of Alvin as a regional church and unique work rooted in a firm vision for dynamic worship encounters, Spirit-directed ministry to the sick and hurting and a bold declaration of the Word of Christ. We believe in one God, existing in three persons – the Father, Jesus Christ the Son and Holy Spirit. God desires all men to be saved and has provided salvation through grace, for those who appropriate it by faith in the death, burial and resurrection of Jesus Christ. Jesus is the only way to the Father and there is no other name given by which men may be saved. We believe the Holy Spirit is given as our Comforter and Teacher, convincing us of our right standing with the Father through the atoning work of Jesus Christ. Subsequent to the new birth, the Baptism in the Holy Spirit with the evidence of speaking in unknown tongues empowers believers to fulfill the Great Commission, taking the Good News into all the world. The Church is charged with two ordinances honoring the Lord Jesus Christ. They are Water Baptism and The Lord’s Supper. In Water Baptism the believer testifies to the work of salvation already accomplished in his/her life, identifying with the death, burial and resurrection of Jesus. The Lord’s Supper or Communion, is administered regularly in remembrance of Jesus’ atoning sacrifice and to celebrate the benefits of our salvation – forgiveness of sins and healing from all diseases. The nine gifts of the Holy Spirit as described in I Corinthians 12:7-11 are relevant for the church today and intended for the common good. They are given to strengthen, encourage and comfort believers (I Corinthians 14:3). Expressed in an orderly fashion they inspire awe and worship, confirming God’s presence among us (I Corinthians 14:25). We believe in the soon return of Jesus Christ to gather the saints to their eternal reward and establish the rule of the Kingdom of God. The Bible is the inspired and infallible Word of God and our final authority for all doctrine, correction and guidance.